“It’s a machine out of its time, in a way. And a lot of us aren’t quite ready for it yet.” Those were our final thoughts on the Microsoft’s Surface Pro way back in early 2013—an impressive machine, but one that was too much future at the time. Well, the future is now, apparently. Within the last month, three of the largest technology companies in the world have unabashedly cloned the Surface Pro 3, Microsoft’s laptop/tablet hybrid champion. 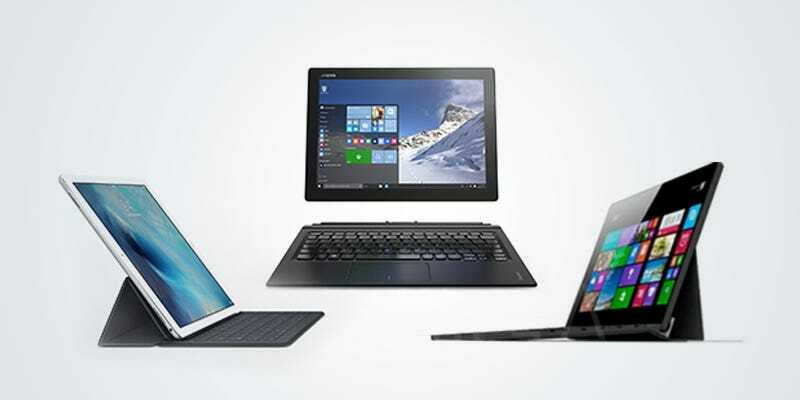 Lenovo now has the Miix 700 Ideapad. Apple has its mega huge iPad, that when combined with the optional keyboard (which, let’s be honest, you’ll probably get because the iPad comes with the dock hardwired into the thing) acts just like a Surface Pro 3 only on a mobile OS. And Dell is working on an XPS 12 2-in-1 complete with included stylus. These join HP’s nearly year-old Envy x2 as a big happy family of Surface clones. Lenovo. Apple. Dell. Hewlett-Packard—all grandfathered from the weird Surface Pro. While three of these machines — the iPad Pro, Miix 700 Ideapad, and Envy x2—are all very much real, Dell’s XPS 12 is the most recent hardware hybrid rumor. In a leak by German techblog Giga over the weekend, the XPS 12 may even surpass the Surface Pro 3 in some ways, including a 4K display with slimmer bezels and Thunderbolt 3—basically a better USB Type-C connector. But that’s not why people want these things. It’s the promise of portability but also power. A slim-fitting design that can work both as a tablet or a laptop. It showcases the future of touch interfaces, whether through our finger or a pen (or Pencil.) As laptops continue the endless for march of being thinner and thinner, keyboards will become optional, much like mobile phones before them, and your standard keyboard and display laptops will soon be boring bricks by comparison. The Surface doesn’t just look like the future, it feels like it, too, and now some of the best PC makers in the world are finally joining Microsoft along for the ride. It should be a great one. Whether the Dell XPS 12 will retain the high pedigree of its laptop counterparts is uncertain—after all the Surface Pro 4 is also set for launch in early October— but you’ll at least have some choice when it comes to this type of machine rather than whatever Microsoft happens to be selling. In a way, the Surface Pro has become a tech soothsayer of sorts, a device that somewhat successfully navigated the middle ground between a powerful tablet and capable laptop. Granted, it took a year or two to fashion the formula into something buyable, but it created this weird, dizzying ouroboros of consumer tech by first conceding to the iPad and then forcing Apple to essentially create its own Surface clone. Now, all tech companies seem to collectively believe that we’re now ready for Microsoft’s Great Hybrid Revolution of 2013. In fact, some people are already celebrating the iPad Pro as some kind of tablet savior. Soon, Microsoft may no longer be the company that does hybrids best, but there’s no denying that the Surface Pro was something fiercely original.